CMOS sensor inventor Eric Fossum discusses digital image sensors: Digital Photography Review – Carpet Bomberz Inc. Slight change of pace this week leading up to the Thanksgiving Holiday. There’s a great video out there for all to see from the creator of the CMOS imaging chip (second generation digital imaging device according to his slides). 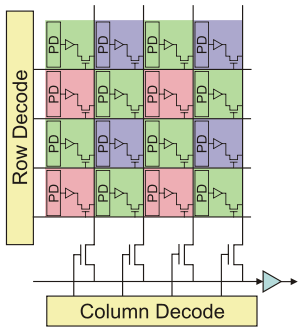 Dr. Eric Fossum talks a little about the implications of cheap image senors, then talks about the technical challenge of getting around CCD’s limitations. CMOS sensor inventor Eric Fossum discusses digital image sensors: Digital Photography Review. Check out the video of the Lecture. Dr. Fossum attempts to address the societal and privacy implications of his invention the CMOS sensor. You don’t find too many scientists willing to engage in this type of presentation. And he brings the thorny issues early in the presentation so that he doesn’t run out of time to cover them by sticking them at the end. Also interesting in this video is Dr. Fossum’s story about how he was assigned the task of improving the reliability of CCDs (charged coupled devices) that were being sent into space. Defects in the sensor could occur when a highly energetic particle entered the sensor and created a defect in the sensor itself (ruing the ability to read out data accurately from the chip). The CCD works by collecting a sample than moving it one step at a time out to the edge of the chip, where it then gets amplified and read, and recorded. So if a defect occurs, the buckets moving a particular row or column of pixels will hit the defect and alter the reading or stop it from reading altogether. Lastly, he covers his research of quanta-image sensor (QIS) which sounds pretty interesting too. Next Next post: GreenArrays, Inc.